There are a wide variety of accessory items that the average shop must have to be efficient as well as have the ability to offer a wide range of products and services. You can certainly take short cuts in many areas but some accessories are a must. Good measuring tools as an example, can be helpful-if not necessary-while other tools are simply for convenience. If you are purchasing for the first time, get the recommendation from the manufacturer of your specific equipment on which items you should start with. Most manufacturers offer a wide range of complementary products to support your specific needs. There are the "must have" and the "nice to have." If I believe it's a really important item, I'll make a special note by placing an asterisk (*) next to the item description. An approximate cost is noted where important to aid you in budgeting. Before we start looking at the tools you may want to own, I want to say one quick word about outsourcing. I recommend that you get to know personally a local sheet-metal house that will work with small metal pieces. This can be an excellent source for shearing, small material jobs, custom bending and more if you don't have the tools on hand to do it yourself. Having a resource close by can get you out of difficult situations and save you freight on materials that you may otherwise need to ship in. That said, let's take a look at the tools individually. Depth Adjuster - A simple accessory that can be used in place of the spindle micrometer for setting depth. Replaces the brass cutter knob. *Vacuum - If you will be engraving on plastic stock, a vacuum is almost essential. Not only does it keep your shop cleaner, it also prevents many problems. Chips can scratch the surface if caught between the material and nosecone. They can also clog up your spindle, which can overheat the bearings and result in costly repairs. I recommend that you invest in a quiet vacuum, available to the engraving industry. If you use a shop vac, you may want to consider ear protection to prevent hearing damage. Work-Holding Vises and Jaws - Jaws or "jigs" come in a variety of shapes and sizes for holding different items. Some examples include seal and medallion holders, pen holders, straight bars for name tags and plates, and dowel pin jigs for odd-shaped items. Check with the manufacturer of your system to see what they offer. Most can be attached to the T -slot table on your system by means of a vise or can be directly mounted to your table. Some systems can accommodate a deep vise for holding large objects that require extra clearance. Many systems have as a standard part of the table construction some type of simple vise that these jaws will attach to. Most jaws are industry standard and can fit any engraving table with adequate clearance between the table and the spindle. *10x Eye Loupe - An excellent tool for checking the quality of cuts or quick inspection of diamonds and other cutting tools, if you do a lot of precision work you will find this invaluable. 30/60/90 Triangle - This is good for aligning plates and re-aligning shear blades during maintenance. It is very inexpensive, only a few dollars and can be found in most hardware store or office supply houses. Dial Caliper - A very quick-to-use tool that is accurate to .001", it's great for measuring the size of a plate, letter height, holes, depth, drill sizes, etc. There are two versions available, a dial type and a digital read-out. Digital Voltmeter - These are generally low-cost and provide digital readouts to indicate AC/DC voltage, resistance, and several other measurements of power. This is a must for those who troubleshoot their own engraving equipment. *Precision Rule - Most standard measurements should be done with a precision metal scale. Scale divisions are available in 1/10th, 1/50th, 1/32nd and 1/64th increments. The 1/10th and 1/50th are the most useful. With the 1/50th scale it is possible to read down to 1/100th of an inch. They are commonly available in 6", 12" and 18" lengths. *Table Shears - Though optional, I consider these to be must-have items, especially if you plan to do trophies, plaques and awards. If you only plan to engrave previously manufactured trophy plates of gift item such as key tags, jewelry or acrylic awards you will not need a shear. I can honestly say that I have never been to a show that did not have one. Table shears are designed for cutting material that is no bigger than 12 inches in one dimension, but any length may be managed provided the material is properly supported. This is useful if you purchase your engraving plastic in 12" x 48" pieces, also known as "half sheets" (NOTE: 24" x 24" is also considered a "half sheet", but will not fit through a 12" shear. Be sure to specify 12" x 48" to your supplier to avoid this problem). By doing your own cutting you will cut costs as well as better manage your raw material inventory. Plastic and metal shears are the two types of shears typically used in the engraving industry. I recommend that you have two shears: one for plastics and one for metals. The plastic cutting shear has a knife upper blade and is used on flexible plastics up to 3/32". On the metal cutting shear the upper blade is squared-off for use on brass (.030" maximum) or aluminum (.040" maximum). Both shears have the same bottom blade. Do not cut the wrong type of material with a shear; it will provide a bad cut and can even damage the shear blade itself. Always use the safety guard that is installed by the manufacturer - it is intended to help prevent serious injury. When cutting long pieces of material, support the material on the right side of the shear, either with a board or a second person helping. Allowing it to drop will produce a concave cut. Blade replacement can be a time consuming and dangerous process. Be sure to do your homework before attempting to replace shear blades. If time permits, send the shear to an authorized repair shop for maintenance. If you do change the blades yourself, keep a spare upper blade. This will avoid downtime while your dull blade is sent out for re-sharpening. The lower blade usually doesn't require re-sharpening unless it gets a "nick" in it. One of the problems with many of the shears on the market is the edge scale. Most are 1/8" thick metal with a silk screened overlay for the scale markings. The problem with this is the thickness of the material that is usually cut is 1/16", not 1/8", which gives a parallax error. (E.g., If the edge scale on the backstop is 1/8" thick, and your material is only 1/16" thick, you must stand directly over the scale to accurately see the markings and align them with the edges of your material). Other possible problems are that the silk screening can wear away at the edge, and the screen printing can often be inaccurate, and not to scale. The only necessary maintenance steps are light oiling and blade cleaning. Always keep your blades free of gummy deposits that result from cutting through double-back tape and protective materials. Use a single edge razor to remove big deposits and use solvents with a rag to clean them off. CAUTION: Even a dull blade can still be sharp enough to injure you - take precautions when touching the blades. Blade sharpening can be done at a local sharpening house and does not need to be done at the manufacturer. Beveler - This tool is used to finish the edges on plastic name badges & signs. This will allow you to put a decorative edge on the material or break the sharp edge that exists after shearing. I recommend choosing one with a vacuum hose attachment to keep your workspace clean. There are several sizes available ranging from a small unit capable of doing excellent work on 1/32" and 1/16" stock to heavy-duty models used to form thick acrylics. Brushes - These are for clean up. Something as simple as a soft toothbrush will work just fine. Save your used brushes you have plenty of uses for them. You'll find that these will be necessary for both metal and plastic so it's helpful always to have a good supply on-hand. Corner Rounder and Dies - These are for rounding, notching, and decorating the corners of plastic and metal plates. Dies are available in several shapes and sizes, including a hole-punch. Before you purchase the dies, be sure you understand the plate thickness limitations and stay within the manufacturer's recommendations. Most dies may be sent back to the manufacturer to be re-sharpened. 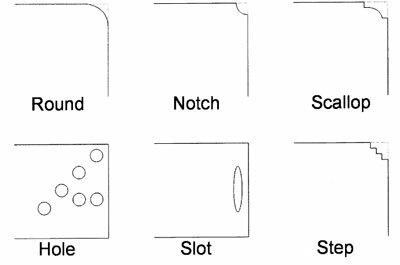 Examples of various cutting dies are shown below. Deburring Tool - This tool quickly removes sharp metal edges. It can also be used to enlarge and clean up holes drilled in plastic. Oxidizer - This liquid adds contrast and gives a blackened appearance to engraved letters on brass and aluminum. It's used primarily when the material is not color coated and the letters would otherwise be the same color as the plate. Refer to Oxidizing Metals for techniques on how to oxidize. Paint Fill Sticks - These are crayon-like sticks of acrylic paint used to fill reverse engraved plastic. Liquid or spray paints can also be used. Be sure to use water-based paints to prevent a chemical reaction with the plastic engraving stock. Check with the manufacturer for specifications and recommendations. Strip Heater - A useful item to bend engraved plastic plates for use as table tents, stand-up signs or fold-over name badges, they are available in different lengths, so choose a size that is wider than the pieces you are bending. Auto Center Punch - This allows easy one-handed marking of a pilot punch dimple for drilling. It replaces a hammer and center punch used when working with metal plates. Cutter Depth Adjustment - This tool allows you to quickly set all your cutters to the same length. Just start with a cutter zeroed on your engraver and set the gauge, then you can quickly duplicate the setting on other cutters. Material Scoring Knife - Used to score flexible plastic material for snapping when a larger shear is not available. Pen Insert - This handy tool may be inserted into your spindle in place of the standard cutter. It is used to pre-test the engraving job by allowing you to do a dry run on paper. This tool will also allow you to do calligraphy on certificate and awards. Pen refills can be purchased from the tool supplier or from a local office products company.